Thanks to many donors and a matching grant from the Hudgens Family Foundation, in 2015, $100,000 was raised for exhibits that would display artifacts from the 1995 Hickory Log excavation completed at the Canton Walmart site. On September 29, 2016, two of three exhibits were opened in the Hall of the Ancients. They include some of the best artifacts from the collection. The History Beneath Our Feet and Life Along the Etowah both explain of how Georgia's first people lived in the Etowah River Valley. Now, in the planning stages, a third exhibit will tell the story of how the Cherokee people lived in north Georgia before their removal to Indian Territory in 1838. This is an interesting tale of how these Native Americans adapted to the ways of the European people who moved into this region. Not only will the exhibit provide information concerning the long, sad ordeal they had traveling to Oklahoma on what was named the "Trail of Tears", it will also explain how these people actually lived for the years before they were relocated. Artifacts recovered from near the Etowah River tell us the Cherokee people traded with the settlers for items used in their everyday life. Silverware, ceramic plates, pieces from guns, jewelry and hardware were found at the excavation site. 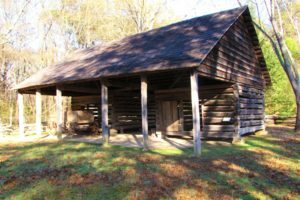 They lived in the Hickory Log District of Cherokee County and throughout Northwest Georgia in log cabins, grew crops and raised livestock. In 1824, a resolution was passed by the Legislature of the Cherokee Nation, appointing and authorizing eight people to take the census of the Nation and prepare correct statistical tables of each district. From this information, we know 1533 people lived in the Hickory Log District. Through research, many interesting facts have been found that will be included in this new exhibit that should be open in late 2017 or 2018.